Dorothy M. Zimmerman, 58, of West Decatur died Thursday, Feb. 2, 2017 at her home. 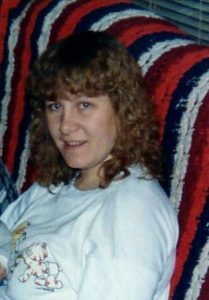 Born July 2, 1958 in Huntingdon, she was the daughter of Joyce L. (Welch) Zimmerman of West Decatur and the late Jesse H. Zimmerman Sr.
She was the former manager of the Fuel On Convenience Store in Chester Hill and graduated from the Tyrone High School. In addition to her father, she was preceded in death by her step-father, Joseph W. Rice and a sister, Joyce D. Zimmerman. Along with her mother, she is survived by one son, Bradley A. Musgrave and his wife, Samantha of Bellefonte; three sisters, Debra Barnett and her husband, Charles Barnett Sr. of Wallaceton, Brenda LeFort and her husband, John of West Decatur and Wanda Goncalves and her husband, Manuel of New Jersey; and one brother, Jesse Zimmerman Jr. and his companion, Chris Melius of West Decatur. She is also survived by two grandchildren, Leah and Hunter Musgrave. At her request, there will be no viewing or funeral service. Place of burial will be at the Baughman Cemetery, RD Tyrone. Heath Funeral Home & Cremation Services in Osceola Mills is in charge of the arrangements. Obituary Notice: Wade “Bud” H. Horseman Jr.